The FUSION are ideal for quantification grade imaging. 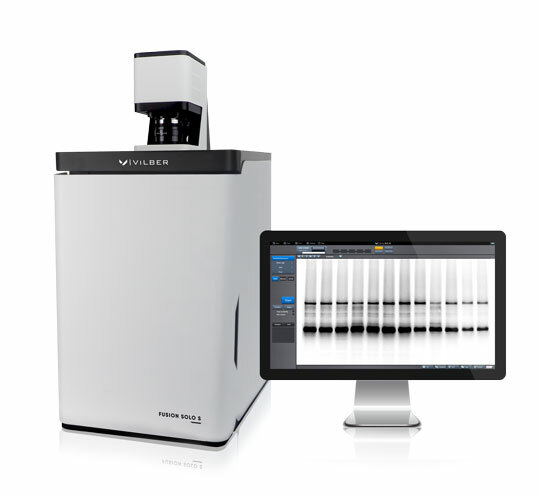 Chemiluminescent Western blot data poses distinct challenges in producing quantifiable, reproducible data. These problems stem from a low-dynamic range of detection and the difficulty in accurately determining the limit of detection. The FUSION eliminates all these issues thanks to its High Sensitivity Reading (HSR) camera technology which delivers reliable dynamic range, linearity and sensitivity for the lowest limit of detection. With the HSR, the FUSION reduces the various sources of noise to the lowest floor level and the signal can stand out from the surrounding background. The FUSION provides consistent and reproducible data, independently of the chemiluminescence time course. The chemiluminescence intensity/time profile consists of an initial rise period up to a prolonged emission at a pseudo-plateau level and a decline. The FUSION Automatic imaging mode compensates the time course of the chemiluminescence reaction by adjusting the exposure time while maintaining the larger possible image dynamic. The FUSION has been designed for maximum ease of use. From its simple installation to its intuitive user interface, this system is plug and-play. The FUSION software is the easiest software to take an image. Place your blot on the tray, select your application, click on Start and automatically the system auto-exposes your blot image, your marker image and combines the two together. The FUSION includes our unique Apps Studio approach to imaging. The Apps Studio is a library which contains 40 different protocols for your blot, gel and other bioluminescence samples. The protocol oriented Apps Studio ensures reproducibility and one click acquisition for the best ease of use. Discover our FUSION Range, Chemiluminescence & Fluorescence imaging systems. Take a look.